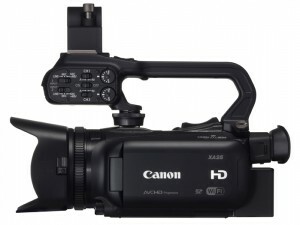 Canon has announced two new siblings for the XA10 camcorder. I’ve been using the small, budget friendly XA10 for a while and the new XA25 (with HDSDI jack) and the XA20 (without SDI) look like huge improvements. First, they have a 20x lens instead of the 10x on the XA10. They have a new sensor which promises an improved image, including in low light. The XA10 was no slouch in the low light department so these should be great. It’s a tiny bit bigger chip but still roughly 1/3″ so don’t expect great things in the shallow-depth-of-field department. But the really interesting thing about these new cameras for us news shooters is the WIFI built into the camera, combined with the onboard dual-memory-card, dual-codec, live-downrez recording. The camera records in AVCHD but will also record to MP4. And not only to MP4 but simultaneously downrez MP4 onto the second memory card. This is important because you can use MP4 files with iPads and for web use directly. So in theory you can handle all of your web streaming and instant video clip postings straight out of camera. Nothing in the release about in-camera editing, though. And if you’re a control freak, you can operate the camera from your smart phone. The release doesn’t mention any improvements on the audio quality, which was a weak point with the XA10 when using the mic level inputs. It does have XLR inputs on a detachable handle; line and mic switchable. The XA10 is tiny and will run forever on an optional extra large battery. B&H has the XA20 and XA25 on preorder for $2200 and $2700. I will update this post when I get my hands on one Monday at NAB. Did you ever get a chance to handle the XA20? Wondering how it would compare to the XF100 for run ‘n’ gun videojournalism work, especially since the prices are almost the same. I played with the XA25 at Canon’s stand at NAB and it is very similar to the XA10 in some respects. I had an XA10 for quite a while. On the XA10, you had to depend on autofocus just because of the form factor, evf size, and lcd size. In most run-n-gun situations that worked great since you’re usually wide angle while shooting. It doesn’t have shallow depth of field so focus is not an issue. From what I saw on the Canon stand, the XA25 is great in low light – for a video camera. It’s no match for a 5d Mk3 but it’s good. I hope to get one eventually. It’s really tiny and you can take it places where a big camera gets you tossed out.